Dr. Ali Thabet is the owner of the newly-opened Infinity Drugs Pharmacy on Jos. Campau. After seven years of hard work and dedication toward earning a doctorate in pharmacy at one of the top pharmaceutical programs in the world, Dr. Ali Thabet has finally reached his lifelong goal of opening up a pharmacy in his hometown. Infinity Drugs Pharmacy, located at 11527 Joseph Campau St., offers a variety of incentives for their patients. The incentives are: free immediate home deliveries, they will beat or meet any price, free blood pressure checks, senior citizen discounts and free medication therapy management. 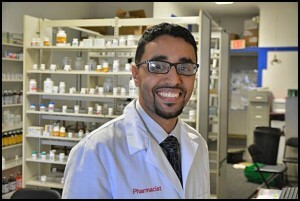 Infinity Drugs Pharmacy is one of many pharmacies located Hamtramck, but Thabet believes that as a pharmacist he brings a uniqueness to the table that his patients can appreciate. Thabet, who graduated from University of Michigan in Ann Arbor, got his education start in Hamtramck. He attended Dickinson East Elementary School, Kosciuszko Middle School, and graduated out of Hamtramck High School in 2005 with a grade point average that ranked third in his class. During his four years of high school, Thabet also earned a varsity letter in basketball, football and baseball; and was a multiple time captain. Thabet said he got the bug for medicine early in life. He also said witnessing the financial struggles of so many in Hamtramck inspired him. Infinity Pharmacy is also a family affair. Ali’s brother Muhammad works there as a technician. “Throughout our lives my brother Ali and I would compete with one another in everything you can imagine,” Muhammad said. “I have to admit that his competitiveness and will to succeed are second to none. In the span of a couple years he turned from the greatest competition I had to the best role model I have.